Pacific Suburu’s vertical garden contains more than 120 plants. When car-buyers stop by Hawthorne, California’s LAcarGUY-owned dealership, they are greeted with a uniquely “green” welcome. The Pacific Subaru showroom features a living wall system, home to more than 120 plants. Installed by Outstanding Matters Landscaping in January 2016, the vertical garden is 4.2 m (13.7 ft) tall and 2.4 m (8 ft) wide. Totaling 10.2 m2 (110 sf) of space, the installation has 10 rows of planter boxes, each with six modular wall-planters containing a mix of six different indoor plants. Independent horticulture supply company Florasource provided the dealership with the pre-grown specimens. LAcarGUY/Subaru Pacific introduced the facility’s living wall system as part of an ongoing commitment to environmental responsibility. LAcarGUY was the first automotive dealer in the country to offer public electric car-charging stations. Similar initiatives are supported at Subaru’s corporate level. Since 2004, the company has built all its cars in zero-landfill manufacturing facilities. 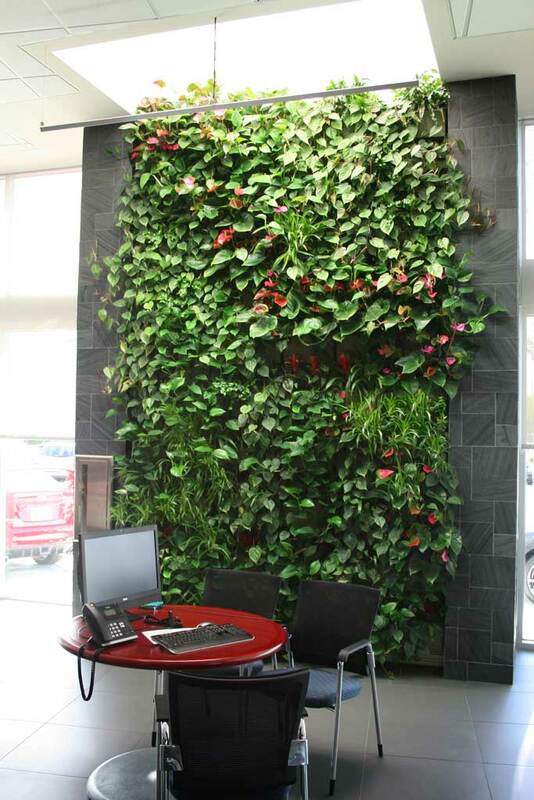 The dealership’s management team is pleased with the results of the living wall system and the positive impact the installation has had on its clientele. At least one new Class A building in Seattle has incorporated a living wall feature in recent months. In general, this is a great idea for a Car Dealership, for the exact reason the GM mentioned. Well done!